You can help orphans become sons & daughters today. 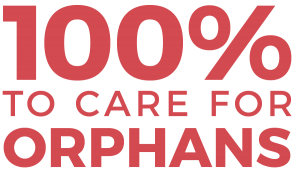 Orphans and vulnerable children around the world need someone to care. Some of these children live on the streets, and many of them are victims of trafficking or extreme poverty. Very few will ever hear the Gospel or learn how much God loves them … unless they are reached. Every child we serve around the world is loved as a son or daughter. And your gift today makes this possible. Here in the U.S. we offer adoption financial assistance to help Christian families bridge the gap in critical adoption funding to bring their children home. Around the world, we provide holistic, Christ-centered daily care. Specifically, every child we serve receives food, clothing, medical care, and shelter. They are given the Gospel and shown how to live as a follower of Jesus. They receive a quality education which provides a foundation for their future. And they experience continued love and support as they transition into adult living. Whether rescuing children on the streets in Cambodia, providing camps for orphaned children in Ukraine, or teaching children in Haiti, your gift shares the Gospel with children in need around the world. Currently, people like you help support 8,362 children in 13 countries. And over 7,000 children have come home through adoption. But we need your help to continue caring for these children and to reach more. God calls us to care for orphans and those who cannot care for themselves. When you give to Lifesong, you reach orphans with the Truth of the Gospel as well as daily care and discipleship. Our administrative costs are already covered, so every penny of your received donation goes to help children in need. YES! I WANT TO HELP ORPHANS BECOME SONS AND DAUGHTERS. Thanks to TMG Foundation and key partners, all of our fundraising and administrative costs are already covered. 100% of your received donation will directly help children in need.